Iranian President Hassan Rouhani says without the sacrifices made by the Islamic Revolution Guards Corps (IRGC), at least two regional countries would have fallen to ISIS terrorists by now. The Iranian president made the remarks in a Tuesday phone conversation with his French counterpart Emmanuel Macron, in reaction to the recent move by the US to designate the IRGC a “terrorist organization”. 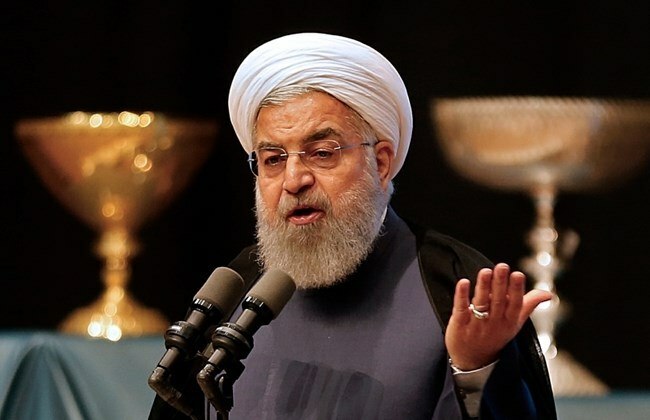 Rouhani described the move as a “very provocative, dangerous, and unprecedented” one in the history of international relations, and said it was made at the request of Israeli Prime Minister Benjamin Netanyahu, as explicitly admitted by him. “Without the sacrifices made by the IRGC forces, at least two regional states would have fallen to the ISIS terrorist group by now,” the Iranian president said. “Through their sacrifices and efforts, the IRGC forces dealt a heavy blow to the ISIS and other terrorist groups in the region,” he noted. In reaction to the designation, Iran labeled the US CENTCOM as a terrorist organization, and threatened that US forces in the region would not have calm anymore. Rouhani, however, told Macron on Tuesday that the Iranian government is resolved to protect regional security and prevent tensions from growing. Elsewhere in his remarks, the Iranian president referred to the Iran nuclear deal and Europe’s commitments under the 2015 accord, saying that both sides of the important deal must fully implement their obligations, so that Iran would be able to reap the legitimate economic benefits of JCPOA. “Despite living up to its commitments, Iran has yet to see any considerable practical move by the other side,” he added, highlighting 14 reports by the International Atomic Energy Agency confirming Iran’s compliance with the Joint Comprehensive Plan of Action. He also called for accelerated and effective implementation of the Special Purpose Vehicle (SPV) introduced by Europe within the frameworks enshrined in the agreement. Macron, for his part, once again underlined that Paris and its European partners are seriously pursuing the implementation of all their commitments under the deal. “France is closely monitoring the regional developments, and will do its best to secure Iran’s interests under the JCPOA,” he said. France and its other European partners will do their utmost to encourage the US to moderate sanctions against Iran, Macron said, highlighting the “highly significant” role of Russia and China in this area. He also expressed sympathy with the Iranian nation and government, particularly the families of the flood victims, saying that his country decides to dispatch humanitarian aid to the people affected. Heavy floods have affected at least 23 of the country’s 31 provinces since heavy downpours began on March 19, killing over 70 people so far. Major floods have been reported in the provinces of Golestan, Mazandaran, Gilan, Kordestan, Ilam, Lorestan, Fars, Northern Khorasan, Kermanshah, Khuzestan, Kohgiluyeh and Boyer-Ahmad as well as Sistan and Baluchestan.